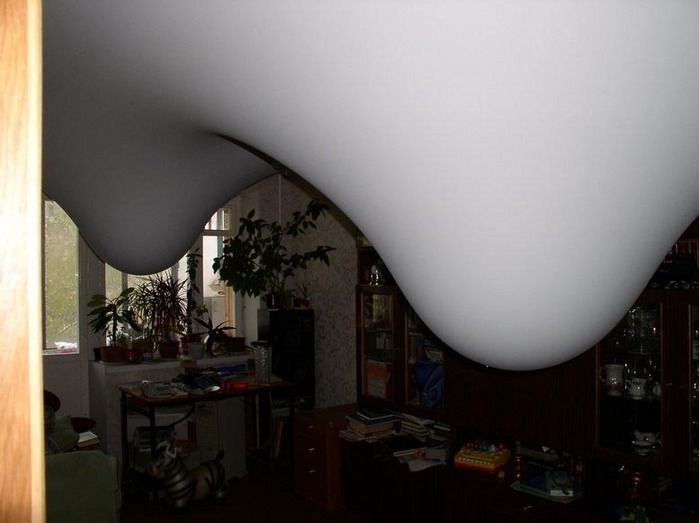 In Russia suspended ceiling is not only a stylish element of the flat interior, it can simply save your dwelling from flood made by the careless neighbors living above. Like in this case the practice shows that it is able to gather and hold all the water. Now the question is how to pour it off safely. But just imagine you wake up one morning and your ceilings look like this! What an amazing ceiling material. What is it? Is there a normal solution to removing the water? When the water is removed, does the material shrink back to it’s original position? To question one’s narrow thinking. LOL. Yes some comment threads have become rather small at times. This is so cool. Is it photoshop or reaL? Look at the pans with nasty brown water. I don’t think that’s made up. I wonder how small too. I think it is Latex like the type in paint. Bah, lets just keep kommenting. This comment thread is beginning to sag. I mean “This thread will acheive greatness”. How many wow i can do! ! ! Can anyone read these comments? Perhaps these comment will reappear. If I could just reach the margin. This could make a unique wallpaper. Is this the end of reason? WE HAVE TO KEEP GOING! Good on you guys, you broke it! Ye, no one can match the industrious minds at englishrussia. Nice decoration. Greek style, I think. Yes it does, and then and angel shows up and sings for you, when the pizza-delivery give you 1000 free pizzas. This is well-known material for renovating your ceiling. You stretch the flexible ‘fabric’ between the walls and you can even hang lamps on it etc. I’ve never heard of it. I think I would prefer solid building science principals to duct tape fixes. I also want to know what this is made of. And that is some dirty water. U got that right. Eventually the whole ceiling will come down. That cheese plant in the corner needs some serious disipline. What a bunch of teeny twerp toilet mouths you are… Has a single one of you foulmouthed posers graduated from highschool yet? In Soviet Russia ceiling ________ you! We had this kind of cieling in Mexico. It was as nice though, but I do remember it collecting water from the leaks in our roof. It never got that full though, and the rest of our appartment wasn’t as nice as the house in that picture. I am pretty sure that the suspended cielings we had were made of fabric(manta) that was painted. The cieling above that was made of bambo with cement poured on top (the bambo was only to hold up the cement while it dried). The description on this photo series is very ambiguous. The text accompanying the photos is ambiguous beyond usefulness. it looks really really ugly, but I’m sure it works. But damn, I can imagine myself walking around at night with the lights off and bumping my head badly on one of those. I wonder how you got the water out of this blops falling from the ceilings. Now we know. Thank you for the link. Very interesting. From your link and the one below, this appears to be a building material we may see more of. Would it not be better to return to your flat and find the ceiling sagging under the weight of Sarah’s bathwater, or find everything soaked and ruined? If the water can be safely removed, replacement of the ceiling would seem cost effective. Nice! But you have to be carefully until you’ll get used to it. Watch your head… Ups. Too late! A person who knows how to use “3ds max” can make those effects. This looks like something out of a Dalí. you have to make sure to seat your mother-in-law in the seat of honor under one of these when she comes for dinner. I simply can’t believe that those pictures are real. Look at them again and get a feeling for the vast amount of water they must be holding. how the ceiling of the comment bellow will look after everyone flood this thread with lame comments? That ceiling looks alive and like it belongs in Disney’s Alice in Wonderland. My anti-spam word is: KGB. I think it might be real. I have seen this type of rubber-sheet inner roofing in Sweden, believe it was popular around 1970s. Makes the roof perfectly non cracked and smooth. And since it is rubber it might look like this when the water leaks from above. Does not have to be enormous amounts either, I think two buckets of water in each bulge will suffice. These pictures are real. The water leaked from heat pipes above (so it was hot and rusty), which makes the story even more interesting. 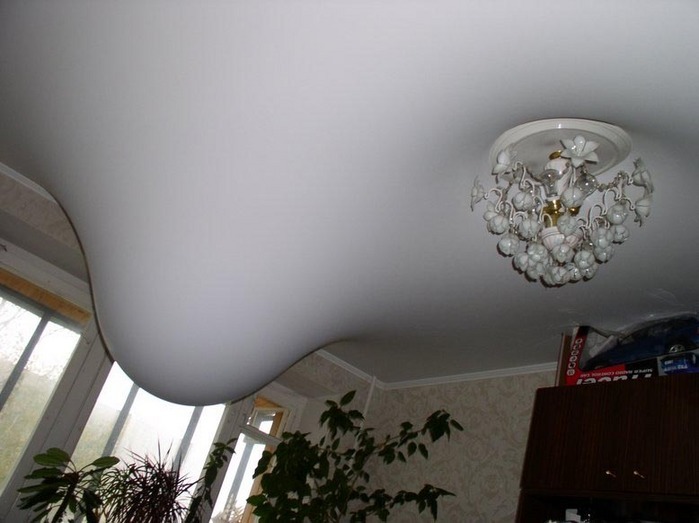 In fact, you don’t have to replace that kind of ceiling after such incidents. After the water is removed, they detach the plastic material from the walls, dry everything, reattach the plastic and heat it up with hot air. It restores its original size and the stretchings are gone. The spec says that it is capable to bear up to 100 liters of water per square meter. But how is the water removed? They cut a hole and drain the water. …and his father in law did cut it. Old bulidings usually have inner roofing by big paper-sheets. The plastic type is commonly used for replacing cracked paper-sheets because these paper-sheets is difficult to get nowadays..
How small can the reply thread get? Thats great. Can someone point me to a blog about russia, in english, where reading the comments wont be a waste of my time? No one can match the industrious minds at englishrussia. 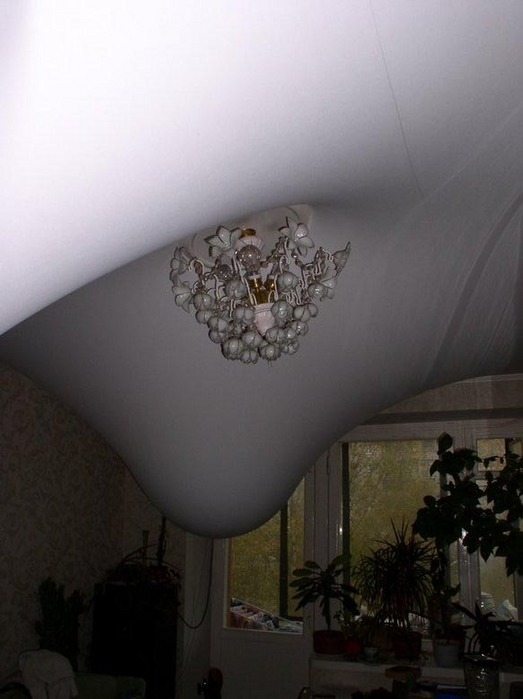 Claims of “Fake!” or “Photoshop!” are nearly always shorthand for “I’m so small-minded and self-centered that I can’t imagine anything beyond my own narrow experience.” The ceilings are made of sheets of PVC stretched on a perimeter frame, most likely made by a French company, Barrisol. You can see a video an installation with a similar problem on their website. That explains it very well. Thanks griff. Well, Timmy go look at that video that griff posted…then maybe you can wake up. VÖRÖS GECIK MIND MEG HALTOK AKKOR IS HA NEM MONDOM…….! Are you all freaks here or what?! 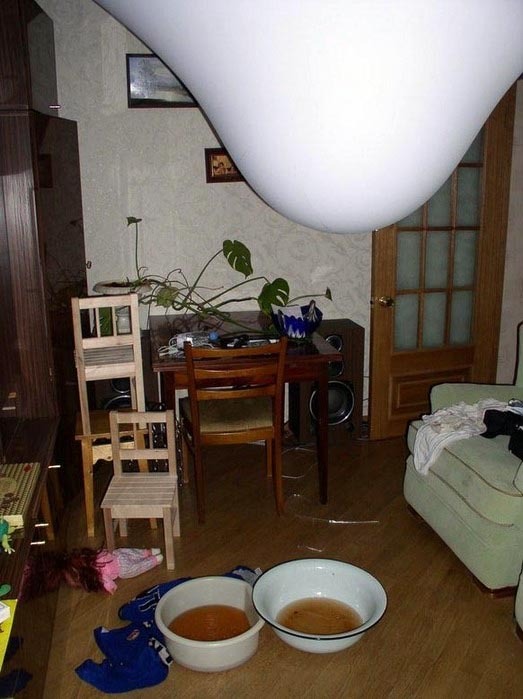 The water pipe of the upper neighbours had broken, and all water leaked through the ceiling and gathered in a so called Stretch Ceiling System, that the owners had installed before. So there is no photoshop or whatever, it is just water. As Butthead would say: Uhhhhh huh huh. Uhhh huh huh huh. I think I saw this on illegal drugs. Also that. Also halfway down this page. What an amazing ceiling material. What is it? how the ceiling material is it . the picture will edit in the photo shop i think .how its possible the ceiling material will be strong only know.how its possible. Definitely remarkable ! I have just ordered a cellular app progress at codingate, they easily determined genuine serious and more than cost-effective developpers who designed the item in couple of nights! !mobile – telecom and voip – net – desktop applications . I really like what you write on here. I try and visit it every day so keep up the good articles!